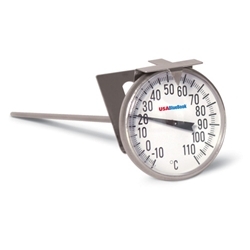 Our dial thermometers have a clear polycarbonate lens and a rustproof 304 stainless steel stem. External adjustment screw allows for accurate thermometer calibration. Accuracy is ±1% full-scale. Each thermometer includes a beaker dip. Field Thermometer has an 8" stem and a 2" dial.